I adopted Hawk (formerly Fandango) 20 months ago. From the moment we met I knew he was the right horse for me. He has such a gentle disposition and we compared him to a Bernese Mountain dog pup - Big, playful, gentle, lovable yet sturdy and stout. He and I bonded immediately. That bond has grown greatly over the past 20 months. We have ridden literally hundreds of mountain trail miles and put in many hours in the arena. He is unflappable. Nothing we’ve come across seems to bother him. If he does get amped up, he instantly comes right back down. I’ve said from the day he came to us that he has the best mind of almost any horse I’ve seen. He is also solid and sure footed - he has huge and healthy feet that carry both me and his 16.2 hand, 1,400 lb frame. I also love his kindness to my grandkids. He spent this week carrying my 4 year old grandson via lead line. I call Hawk our gentle giant, yet he has the forward movement and endurance that I want for our riding. Our passion is extreme trail riding. Over last summer and this we’ve spent many weeks in the Oregon Cascades. We’ve ridden parts of the Pacific Crest Trail, Oregon Coast range, Simco Mountains of South Central Washington and last month we rode to the top of Paulina Peak - 7,984 feet of elevation. We’ve crossed rivers, swam in lakes, galloped in the Oregon Coastal surf and ridden up and down valleys and peaks. We’ve also been competing in the Western States Stock Horse Show. The arena work does not come as natural to either of us as the trail, but Hawk gives me his all. As I work towards becoming a better rider, Hawk is right there with me and willing to ride Pleasure patterns, reining patterns and Arena trail work (which we enjoy the most). My goal is to become a more quiet, polished rider through all of the arena work and Hawk is the horse who will help me on this journey. My trainer, Stacey Riggs knew of MCR and had told us of the quality of the horses she had seen and the care and gentling they had received. My wife and I were following MCR through social media and through Sound Equine Options and through Stacey who made a trip to MCR in December of 2016. Stacey knew I was looking for a big bodied good horse. She called us from MCR and said she had found my horse. She brought Hawk home and we’ve been writing our story ever since. I have no regrets, only positive things to say about Hawk and MCR. He came to us gentled and with considerable ground work which set us up to saddle break and start his training. Thank you MCR for giving Hawk an incredible start and for trusting me with him. "I love Jedi (formerly George) for so many reasons! His personality is affectionate and a little goofy. He is a fast learner, and was well started by the trainer at MCR. He is calm and levelheaded for his age. I could tell immediately that many of the potential ‘green young horse’ issues had already been worked through. He has great conformation and is a pleasure to look at. I also love that he gets along easily in a herd environment with my other horses. Jedi and Lisa on left. Jedi and I have been together for about 18 months so far. We had a few glitches in our early relationship, mostly due to my poor riding skills and lack of confidence. Thankfully, my trainer Stacey Riggs is a patient and consistent teacher. We are coming along very well now with improvements every ride. We just began showing in the American stock horse Association shows. We also do trail riding and horse camping. I chose to adopt a formerly wild horse for several reasons. 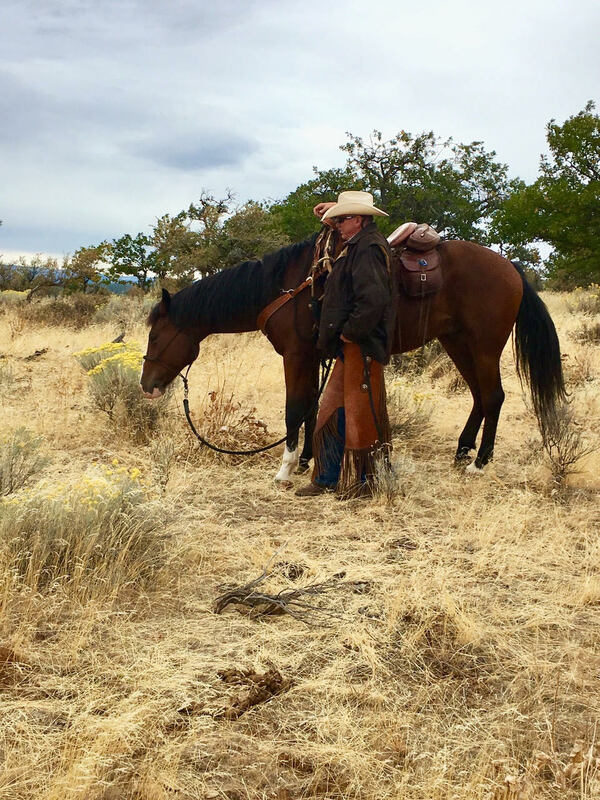 Before I began taking lessons with Stacey, I followed her adventures with gentling and training wild horses. I also knew other people who had mustangs and I like those horses. I believe in adopting animals rather than encouraging breeding. When Stacey met Jedi, she thought he would be a good fit for me, because my Arab mare had turned 29 as was beginning to slow down. She just had a feeling that Jedi and I would be a match. And she was right - I fell in love with him the moment I saw him." 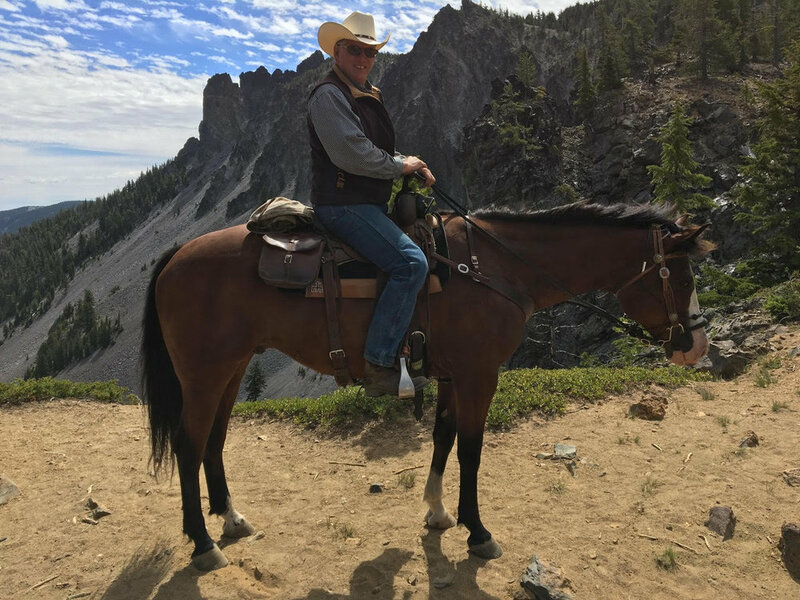 "What I love about our MCR horse Gus, is that I know he has had the very best of care and training since coming to the Ranch. 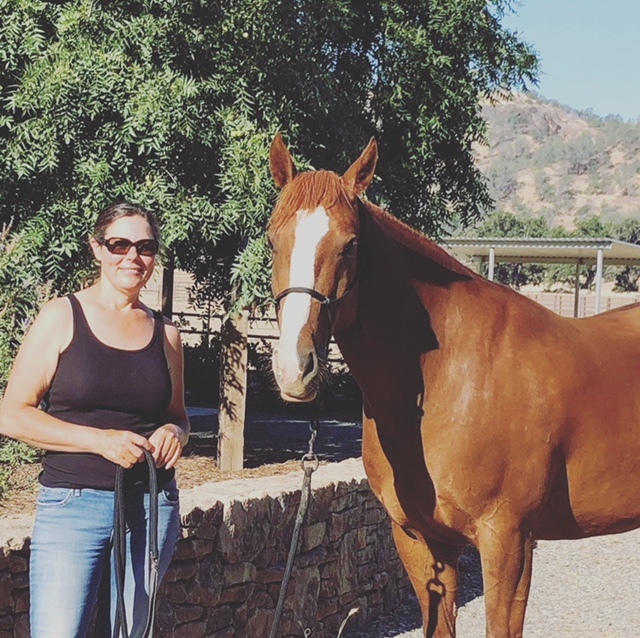 I know that the horses at the Ranch have a solid foundation and that Director of Horse Training, Nancy, will be honest and upfront about any issues or concerns she may have. My daughter Reagan is currently competing with Gus at the American Stock Horse Shows. They compete in reinging, working cow horse, ranch trail and stock horse pleasure. We also use him for trail riding and loving on. He is the first horse to come greet you in the field. We have been involved with Mustang Million and Extreme Mustang Makeovers and that is part of our connection with MCR. We love the clean slate and versatility of the mustang. We have brought 8 MCR horses up to Oregon and they are all now in loving homes. They are good minded, sure footed and a pleasure to be around." "I actually never considered adopting a mustang until I saw Red's (formerly Jax) picture. It was love at first sight, and I knew we were meant to be together. Now I'm a huge mustang fan, and plan to adopt another one soon! I think my favorite thing about Little Red is how versatile he is. No matter what I want to try, cattle sorting, jumping, trail riding, obstacles courses, going to the racetrack, he is always 100% willing to jump in the trailer and go. He's been the best partner and even though he's feisty and a bit of a mischief maker, he is always ready to try something new! We have some fun clinics and obstacle challenges coming up, and we're working on hitting our goal of 100 trail miles this summer." "It's been a bit over a year since Indie (formerly Troy) came to us. I love his ability to adapt, live in the herd and be a horse. It sounds simple, but they have bred a lot of "horse sense" out of horses in barn programs. Today we are pulling out for another trip, packing into the wilderness and Indie is my husband Ian's lead ride, hauling a string of mules, stepping through the forest, meeting hikers, dogs and adventure with a calm demeanor, steady hand and strong legs. We had criteria for our next horse, and none of it said 'mustang' or 'wild'. 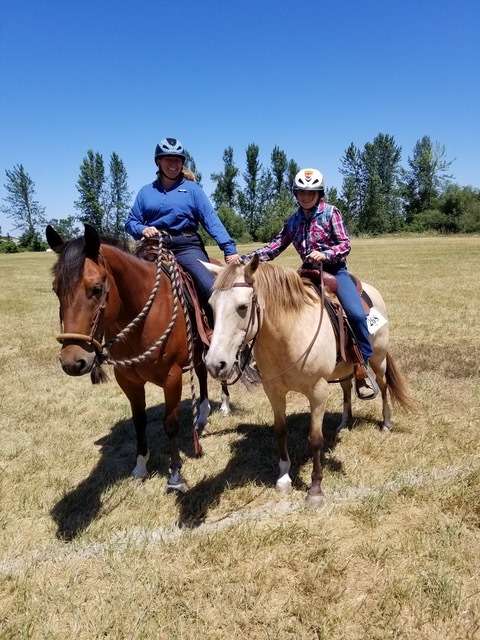 Indie was brought to the ranch with Stacey Riggs from MCR, along with some clients and friends of hers to enjoy a trail ride. My husband swung up on Indie and it happened. That avatar moment where the connection is made and 'two' become 'one'. Indie did not yet have the experience or confidence, but we could see that with time and patience he would become a great horse. We are equally grateful and amazed and hope to bring one more magic horse from MCR into our lives this coming year." "I love everything about Strider (formerly Triumph)! I love that he comes to me when I walk out to the barn. I love that he is so curious, playful, and smart. He is very easy going and nice to ride. Four days after bringing him home I threw him in the trailer and went to a 4-day clinic. He was awesome! People couldn’t believe that I had only had him less than a week. He tries to do and understand everything I ask. All in all he is a great partner. I love that I walk away from my rides feeling happy. I plan on just having fun with this horse. I enjoy learning new things and striving to be a better horsewoman. Strider is the perfect partner for it. Cowboy dressage is on top of the list, along with trail riding, horse camping, maybe a shorter endurance rides. I became interested in Mustangs several years ago after going to an event that had mustang adoption on site. I walked through the corals and something in the eyes of these horses resonated with me. I have always loved mustangs but never considered owning one. The more I learned about mustangs the more I wanted one. The plight of the mustang is heart breaking and I was interested in doing something to help. My hesitation was knowing I did not have the skill to train a wild horse. So when I found myself shopping for a new horse I asked a woman I know who is a TIP trainer about trained mustangs. She referred me to MCR. I now have this beautiful, kind, intelligent, willing partner out in my pasture. The best part is knowing the money I paid for this gelding will go to helping more wild horses find homes."